When the NHL held its expansion draft on June 21st to fill out the roster of the new entry in the league, the Vegas Golden Knights, Washington Capitals fans were holding their breath to see if the Golden Knights would select defenseman Nate Schmidt or goaltender Philipp Grubauer. When the Golden Knights selected Pittsburgh Penguin goaltender Marc-Andre Fleury and then the Capitals’ Schmidt, Grubauer returned to the fold, the final touches being a one-year/$1.5 million contract that Grubauer signed as a restricted free agent on July 6th. And with that, what might have been the best goaltender tandem in the NHL was reunited for another season. Braden Holtby might have received all the attention in 2016-2017 as the defending Vezina Trophy winner, and he would prove no fluke in finishing second in the Vezina voting in 2016-2017. But Philipp Grubauer put together a superb season of his own, posting career highs in games (24), games started (19), wins (13), save percentage (.926), shutouts (three), and total minutes played (1,265). He performed well at any volume of shots, not withering under large shot volumes and not losing focus with low shot volumes faced. Odd Grubauer Fact… In 24 appearances last season, Philipp Grubauer did not post consecutive games with a save percentage under .900. 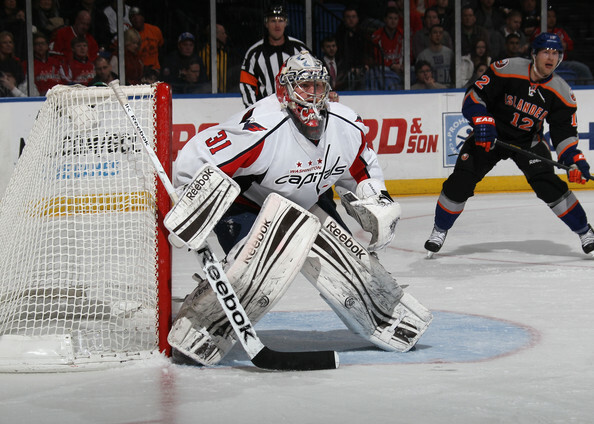 Bonus Odd Grubauer Fact… Philipp Grubauer was undefeated on Verizon Center (now Capital One Arena) ice last season, going 5-0-0 in seven appearances, an 0.72 goals-against average, a .973 save percentage, and all three of the shutouts he posted overall. It was quite an improvement on his 8-6-4 win-loss record at home coming into this season. If you think of backup goaltenders as being roughly in the 500-1500 minutes played range, Philipp Grubauer was third in that group last season in save percentage (.926) among 22 such goalies, and he was second in goals against average (2.04; Aaron Dell of the San Jose Sharks topped both lists with .930/2.00). Grubauer was second in that group in shutouts (three, trailing Nashville’s Carter Hutton by one). Grubauer is the team’s all-time leader in goals-against average among 24 franchise goalies appearing in at least 50 games (2.25 in 66 games). He is also the franchise leader in that group in save percentage (.923). Philipp Grubauer had two different seasons that can be divided by that goofy 8-7 overtime loss to the Pittsburgh Penguins on January 16th. Before that game, Grubauer was 8-1-1, 1.96, .927, with two shutouts. He gave up more than two goals only twice in ten appearances. Starting with that weird loss to the Pens (he got the overtime loss decision), he wrapped up the regular season with a record of 5-5-1, 2.30, .920, with one shutout. He allowed more than two goals six times in 14 appearances. The Big Question… What sort of “contract” year will Philipp Grubauer have? When he was passed up by the Vegas Golden Knights in the expansion draft, Philipp Grubauer signed a one-year/$1.5 million contract to remain with the Caps. When that contract expires, he will be once more a restricted free agent. It does not set him up for a big payday, at least with the Capitals, but how he performs in this “contract” year could set in motion an interesting sequence of events that have a lot of moving parts that have little to do with Grubauer. A season like the one he just had (albeit with perhaps a stronger finish) could make him an attractive trading asset for a club that could use some replenishment in the prospect stream. The club’s willingness to go down that route might depend on how well prospect goaltenders Pheonix Copley, Vitek Vanecek, and Ilya Samsonov perform this season in their respective roles. Grubauer has always been in something of an odd situation with this club. Despite being a more than capable performer as a backup, he has been caught between a franchise goalie in front of him in Braden Holtby and perhaps one behind him in Samsonov, who was the first goalie taken in the 2015 entry draft and who was described in a scouting report as follows: “based on talent and projections, the Russian is viewed by many a foundation piece netminder.” Where this leaves Grubauer is in a strange sort of limbo as he enters a pivotal season for his career. Having perhaps the best backup goaltender in the NHL (now that the Murray/Fleury combination has been broken up in Pittsburgh) is a luxury that the Capitals have and few, if any teams can hope to match. It provides the club with the means to give number one goaltender Braden Holtby nights off, even if his preference might be for a heavy workload, without an appreciable drop off in performance. But the discussion does not do adequate service to Grubauer as a fine goaltender in his own right. That he enters his sixth NHL season as a backup to Braden Holtby says more about Holtby and his consistently elite level of production more than it says about Grubauer. He might be a worthy starter in a quarter to a third of the teams in the NHL right now. Grubauer has been patient, quietly assembling an impressive resume as a backup and giving the Caps dependable minutes in that role. But time is relentless, and Grubauer will be 26 years old in late November. When you consider that Ilya Samsonov, who might be the next franchise goaltender in waiting, will not be 21 years old until February, and Pheonix Copley or perhaps Vitek Vanecek are available to assume backup duties if needed after this season (if not this one), it places Grubauer in an uncertain spot with respect to his future with this franchise. Grubauer has used time and patience as those “powerful warriors,” but neither is in limitless supply. It might make this season as much an audition for his next team as it will be one trying to get the Capitals to that promised land of a championship.